Recently a writer out of Philadelphia, PA, Tunisia Jolyn contacted me about her latest book of poetry entitled: Life in Technicolor | Volume 1: LOVE. Once I opened the package mailed to my office, the book cover was artistic and I immediately started reading it. I’ve often wondered what love means in the 21st century with many people getting divorced; there are more single women today than in the 1900’s, and men are just you know, men (no pun intended). Tunisia Jolyn’s new book of poetry puts my mind at ease in knowing that experiences are always the best teacher. Love is a familiar territory if you’ve been searching and knowing its radiance. At times it takes a poet skilled in language to put it all in perspective for the millions in line waiting for commitment and security. As I continued to read, it struck me that Tunisia Jolyn never bashed love, whether it’s received or turned down. Her verbal breakdown of the verb is fascinating. Personally, I’ve never read a book that makes you want to alter your opinions about love within five minutes of reading. This weekend, my plans are to book a second hot date with Life in Technicolor | Volume 1: LOVE. You should try it out. It’s that damn good! 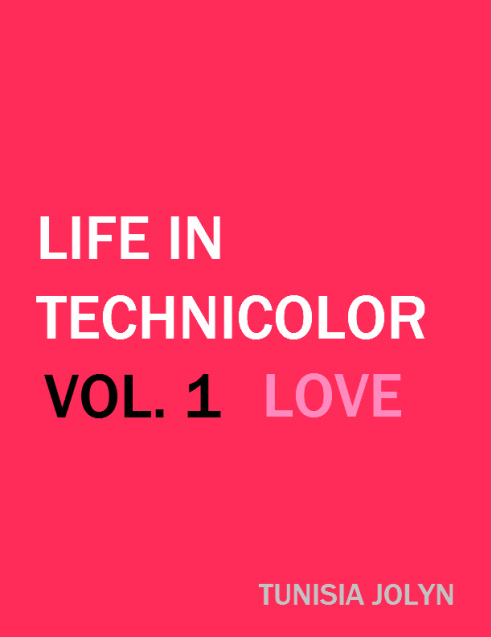 Life in Technicolor | Volume 1: LOVE is available for $2.99 via the author’s website, and the writer is allowing the public to read a few of the poems online for FREE. I don’t ever reblog posts but I just got my first review of my first official book and well… once you read it, I think you know why I broke my golden rule. I send so much love (how fitting!) to Kymberly Keeton for this review and her overall support of my writing. I am truly thankful. mixed signals so near and affectionate when we see every single other, but with months between calls and dates. says that he was clearly creating a public statement. I chose to study that assertion as PLAYER’!